The Orange defeated the Flyers in the first NCAA tournament game on Friday and will face the winner of Michigan State and Tennessee on Sunday. The first half of the game between No. 10 seed Syracuse and No. 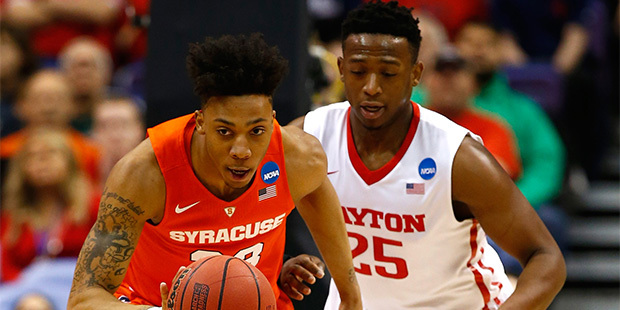 10 Dayton in the Midwest Regional in St. Louis was competitive, ending in a 30–28 lead for the Orange. But the Flyers were flat coming out of the locker room, allowing Syracuse to go on a 12–1 run in the first six minutes. Dayton scored just 23 points in the second half. Syracuse freshman guard Malachi Richardson led all scorers with 21 points en route to the Orange’s 70–51 win. Syracuse was one of the most controversial inclusions in the field of 68. The Orange ended the year by losing four out of their last five ACC games and then dropping their second-round conference tournament game against Pittsburgh. Syracuse’s win here doesn’t validate the Selection Committee’s decision to include the team, but it is an indication that the Orange could be better than their record, which is now 20-13. Still, Syracuse’s bench is almost nonexistent—the Orange were 350th in bench minutes this season and only used seven players on Thursday—which makes it hard to image a deep run for this team. Dayton’s loss also means that Archie Miller Watch 2016 will officially begin. Last summer, Miller signed a contract extension through 2022 and four of his top five scorers from this team will return next year, but his name will still be linked to every major job opening this spring. The Orange will face the winner of No. 2 seed Michigan State and No. 15 seed Middle Tennessee State on Sunday in St. Louis. The Spartans and the Blue Raiders tip at approximately 2:45 p.m.